I love futuristic science fiction. I like action oriented tales that take place within a well thought out and detailed future. 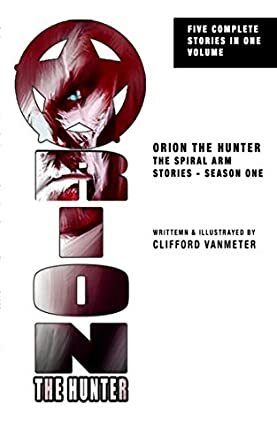 That is one reason I loved Orion The Hunter: The Spiral Arm Stories Season One by Clifford VanMeter. The action and the future that the story takes place in are so detailed that it’s not difficult to imagine yourself there, or imagine the situation that the characters find themselves in. I read somewhere that Gene Roddenberry imagined Star Trek as a kind of wagon train to the stars. I see Orion The Hunter as a kind of gritty bounty hunter to the stars. The playing field is larger, but many of the elements involved are the same. Orion is a survivor. Orion is an alpha male who has had a hard life. But instead of this making him cruel, it has caused him to have a keen appreciation for justice. It has made him something of a champion of the downtrodden. I like Orion. I like his partner. There are a lot of interesting characters in Orion The Hunter and Clifford VanMeter is very good at depicting them. He gets the details of personality, species, gender, and economic status just right. In many ways, Orion the Hunter reads like an old fashioned detective story with a lot of interesting low-life characters stirred into the story to give it spice and to make the outcome more of a surprise. The plot is a familiar one, but the futuristic setting makes it like something that is new. The setting is very important to this story and helps set the tone. The writing is good, and the perspective is new and unique. If you like sci-fi adventure without the hard science, then this is the book for you.